September 2, 2017 at 12:10a.m. Boardman had a match-up to exploit. Spartans head coach pitted Joe Ignazio quarterback Mike O’Horo against Howland’s young secondary to great effect in a 35-17 victory on Friday. “Mike is one of the best quarterbacks in the area and we wanted him to come out and prove to everybody that he belongs,” Ignazio said. O’Horo went 18 for 27 for 222 passing yards and three touchdowns to one interception. He picked up another TD on the ground. He threw to seven different receivers during the contest, which was the first between the two sides since 1987. “We saw on film that a lot of passes would be open and we took advantage of that really early,” O’Horo said. “Our offensive coordinator [Kris Reash] does a good job of spreading the ball around and keeping the defense on its toes. While O’Horo had the big numbers, defensive lineman Stephen Amstutz had the play of the game. Howland quarterback Samari Dean did an excellent job leading a 55-yard drive that ended with a 21-yard touchdown pass to Nathan Barrett to make it 21-14 in favor of Boardman (2-0) with 49 seconds until halftime. Howland gets the ball back out of the break and the Tigers drove all the way to a fourth-and-short at the Boardman 10. Amstutz stripped the ball from Dean, recovered the fumble and ran 85 yards before getting tackled at the Howland 5. He knows he’s going to get some grief from his team for not scoring. 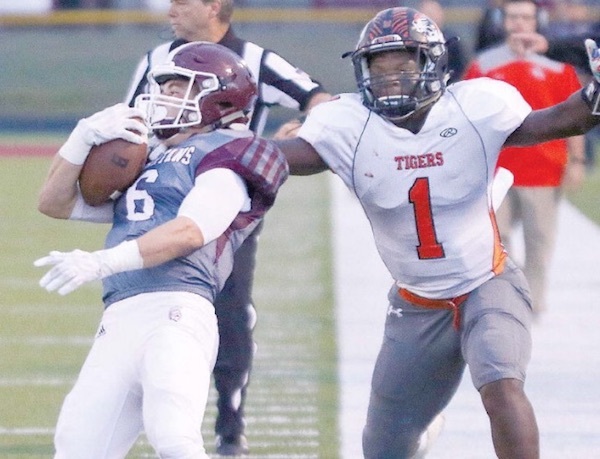 O’Horo made sure the Tigers paid for the mistake with a 5-yard TD pass to Keyshawn Colmon. Howland never got that close again. Howland gave up 332 yards in Week 1 and after Friday night, it’s clear the Tigers (1-1) miss the now graduated Victor Williams and Stephen Baugh. Domonhic Jennings led Boardman on the ground with 126 yards and a touchdown. Jackson Deemer ran for 84 yards and a touchdown for the Tigers. Dean was 7 for 11 for 98 passing yards for the losing side. November 4, 2017 12:09 a.m.
August 27, 2016 12:09 a.m.